I try to design a new set of holiday gift tags to use on my gifts every year, and this year I had a lot of fun with a wintry holiday theme. Icy blues, teal, pink, and red have been some of my favorites for the holidays over the past couple of years, and I made use of most of those in this set, which includes ten different tag designs. Print them onto cardstock and punch a hole for twine or thread, or print them onto sticker paper for festive holiday labels. 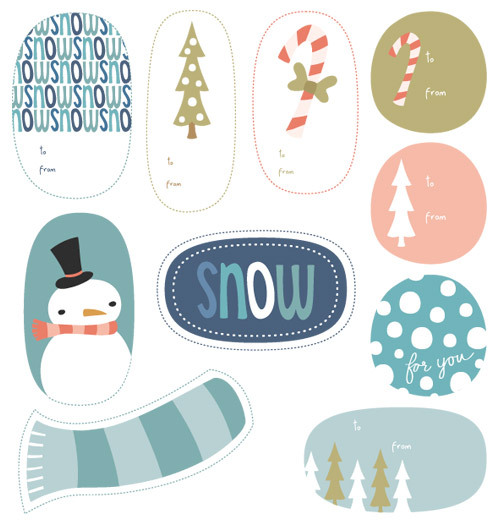 Download the Wintry Holiday Tags (185Kb PDF). These are SO cute! Love the style. Thanks, Erin and Molly! Aww, E, you flatter me! they are BEAUTIFUL! thank you so much!!! Gorgeous! I love these! Thank you for sharing! These are crazy adorable Kristen! Thank you so much for sharing them with all of us. Thanks again! I cannot wait to use these this year! Wow! Thanks so much for the freebie! Glad to find you! these are terrific. Love your other items in the blog, too!! thanks for sharing! these are very stylish! These gift tags are precious! Can’t wait to use them on presents for my family. Thank you for sharing your lovely designs with all of us. Great gift tags!! I love them! Thank you!! They are lovely! Thanks for sharing your work! I think my Christmas gifts will be beatifully wrapped this year with all these great and lovely tags! Thanks heaps these are so lovely!